Mumbai: Asia-focused private equity firm New Silk Route (NSR), which offers growth capital to private companies, is looking at investing nearly ₹ 150 crore in Hubli-based VRL Logistics Ltd. In December last year, VRL had filed for an initial public offering with plans to issue 23.5 million shares. It had not finalized how much money it wanted to raise from the equity market. In its prospectus, the company had said it intended to use the proceeds to buy new vehicles and repay debt. The IPO plan has now been deferred. “The deal hasn’t closed yet, there are a few pending issues that we are currently negotiating on. The talks are in advanced stage and we are hopeful," said an official at NSR, who did not want to be identified. NSR, which has invested in Coffee Day Resorts Pvt. Ltd, 9X Media Pvt. Ltd, Aster Pvt. Ltd and Reliance Infratel Ltd, invests at least $35 million in each deal. Logistics has been an area of interest for NSR, besides domestic consumption-driven sectors such as healthcare, education and restaurant chains. Mint’s Deepti Chaudhary talks about the major deals of the week and what we can expect in days ahead. Vijay Sankeshwar, founder, chairman and managing director of VRL, said his company is in advanced talks with PE firms to raise funds and trying to address some glitches in the prospective deal. He did not divulge details or elaborate on the nature of the glitches. 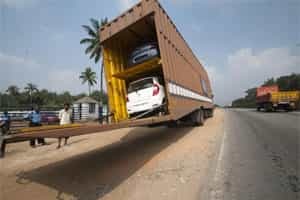 India’s transport and logistics segment, which accounts for 12-13% of the country’s gross domestic product, is expected to grow at a compound annual growth rate of about 8% in 3-5 years, according to the Confederation of Indian Industry. A lot of the investor interest in the logistics sector “is due to the level of growth potential these companies have in India, said Manish Saigal, partner (advisory services) and national industry head of transport and logistics at consulting firm KPMG India Pvt. Ltd. “The potential is because of the scope of organized play and outsourcing done by industries like manufacturing." Striking deals in the logistics segment, though, is not easy. One of the biggest challenges investors face is the lack of sophistication in financing and accounting processes. “Corporate governance and practices like facilitation payment are a serious concern for investors," said Saigal. On an average, companies in India outsource 52% of their transportation and logistics activities, according to a KPMG report on logistics released earlier this year. There has been a steep rise in the number of logistics investments this year. Eight deals in the sector worth $148.7 million were concluded this year so far, compared with five deals worth $43.9 million in the whole of 2010, according to VCCEdge, which tracks PE investments in India. Saigal said logistics companies are a bit elusive of tapping the capital markets now because of the slowing economy. “The external conditions for logistics are little depressed. Hence, private equity deals are an attractive option for logistics players," said Saigal. VRL works largely in the less-than-a-container segment, in which the company aggregates parcels in a hub before distributing them. The company has also entered the warehousing business by offering value additions to products on behalf of clients.